I was at brunch with Nathan this afternoon when "Your Body Is a Wonderland" came on over the restaurant radio. As I always do when this particular (&, I suppose, particularly cheesy) John Mayer tune comes on, I thought of Dave, of discovering Room for Squares for $1 at a second-hand music store in 2001, before anyone else had ever heard of it - & then, with a start, I realized today's date, & I teared up right there in the middle of an aluminum diner while trying to decide which breakfast sandwich to order. At 3:31pm, as I write this, I recognize that it's about the time of day, I think, that it happened, that he did it, or at least around the time he would've been discovered. It's been eight years today - and for the first time, maybe ever, it feels like it's been a really long time. Maybe it feels like such a long time ago because I can, finally, hardly remember the girl I was then, with him, before he died. Maybe it feels like such a long time ago because I am no longer in contact with any of his friends or family, finally cut ties with his best friend Kevin this year, so there's no one to hurt with or remember with. Maybe it feels like such a long time ago ago because so much has happened since then, a life & a girl almost literally unrecognizable. Or maybe it just feels like such a long time ago because it was such a long time ago. I forgot his birthday this year, didn't even realize it had happened. I was visiting D.C. that day, staffing a conference run by my old office before spending a week in the city. I was busy working all day, busy meeting an old friend for Thai dinner, busy spending that evening with some of my favorite people in the world, catching up on years & stories past. It never occurred to me to go back a few years further, to recognize the date, to mourn for even a moment the anniversary of the day my first love turned 20 & decided he didn't want to be present for adulthood. It was nearly a full week later, after I'd left D.C. & returned home & thought to myself "That day is coming up soon" that I realized I'd actually missed the day entirely. I've always been afraid people would forget all the good things about him & remember only how he was at the end, that his death would overshadow his life. I promised myself that even if no one else remembered all the good things about him, I would, that I would always remember who he was & how he made me feel, that his death would always have some sort of meaning. Now, it seems, I can't guarantee that anymore, to myself or to anyone else. I can't guarantee anymore that I'll always remember today, that it will always feel like it always has, that I'll be the last one standing with this torch I promised to keep carrying. And that's scary, you know? It's scary to have such a bad memory & to concede this piece of it along with all the other pieces I've been less terrified to forget. I knew today was coming because I always know it's coming, but its impending arrival didn't loom over me this time like it has in years past. Still, given the birthday boondoggle, I was struggling to fall asleep two nights ago when I suddenly jolted to full awakeness: Did I miss this one, too? I was relieved to assure myself I hadn't, but just in case my memory betrayed me over the next 48 hours, I fell asleep remembering him. 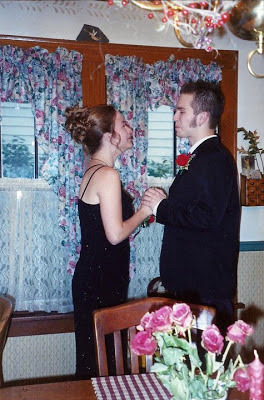 I fell asleep remembering hot chocolate on the Riverfront & a first kiss to Dave Matthews & fireworks at Lake Anna & his performance at the high school talent show & the time I made us terrible spaghetti for dinner. I fell asleep remembering brown sideburns & tattered Chuck Taylors & thrift store T-shirts & the star tattoo & those soft lips & that beautiful mind, nights spent listening to Dashboard Confessional & Gloria Record & Brandtson, talking about love & luck & lives in NYC. I fell asleep remembering a boy who loved a girl who couldn't love him back the way he wanted her to, the way she so desperately wanted to. I fell asleep mourning the death of a fragile, radiant soul who lost his way & got stuck in the darkness of his own mind, and mourning the death of my innocence & so, so much more. Yes, it was such a long time ago, & so much has changed. Yes, this is love for the first time. Yeah, well, weren't we all once, before we felt loss for the first time? Well, this is the last time.